As a wellbeing coach and gut-health warrior, Holly creates delicious and nutritious recipes to boost and revive mind, body and soul. Understanding that optimum health begins in the gut, her vibrant and nutrilicious creations help to bolster, fortify and restore in the most health-reviving way making you glow from the inside. This nutrilicious smoothie concoction is absolutely jam-packed full of beautiful, healing ingredients. Watermelon is an amazing anti-inflammatory which is amazing for gut health and turmeric is a natural immune-booster; so essential for the winter months. Not only will this blend nourish the skin, it will also bolster and fortify the mind, body and soul! Who could ask for more, hey?!? 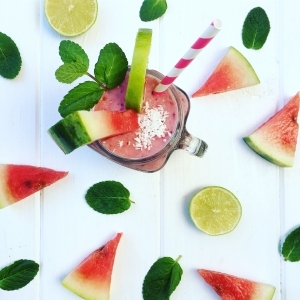 Watermelon is also great for the immune system helping us to fight-off infections and viruses. It’s bursting with vitamin A which is crucial for healthy skin, teeth and bones. It’s also rich in fibre and potassium, both of which maintain good digestive health and help us to sleep better! 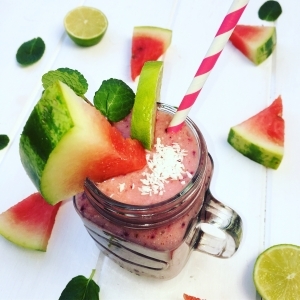 Melon in all its various, vibrant guises has been shown to reduce cholesterol and lower blood pressure; both so important in terms of our overall wellbeing. High blood pressure can be detrimental to heart health so it can really help to eat foods that are going to sooth and calm the body. Fresh mint has a cooling and calming effect on the body and when mixed with potassium-rich coconut water, they’re absolutely guaranteed to hydrate after a busy day whilst replenishing lost electrolytes. It’s so important to stay hydrated, especially during the colder months as central-heating and chilly winds can dry-out the skin. 100g of cashews or vegan protein powder. I hope you love this recipe! It’s the perfect blend to get us ready and raring to go for spring! A luxury box of nourishing, self-care sunshine to add some magic and sparkle to your day. It has been lovingly-curated to promote wellbeing in mind, body and soul and to remind us that taking some ‘me-time’ is so important for our health. Check them out here!